Choose from Swedish, deep tissue, lymph drainage, aromatherapy or a combination of these, to treat your body’s needs. All massage treatments incorporate Tisserand essential oils from England, made by renowned aromatherapist, teacher and author, Robert Tisserand. Oils are blended for your individual needs. All massages available are perfect gifts! A relaxing massage of the back, shoulders, neck and head. Can also be booked with a facial. A deep massage that treats localised problem zones. Our most popular massage. Generally relaxing and restores balance. 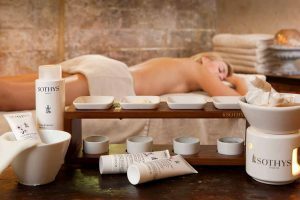 A very long, indulgent massage where you customise your experience by choosing from three types of massage mediums to suit your skins needs. Then choose from three Sothys aromatic oil blends or we can mix a specific essential oil blend for you. Includes complimentary sauna use (allow extra 15 mins). 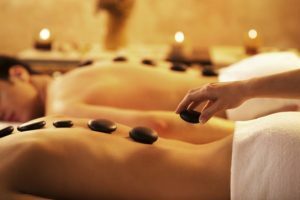 Stones are warmed and anointed with your chosen oils and placed on key energy points of the body producing a deep, penetrating warmth to release blocked energy, inducing a state of calm. Then traditional techniques are used with the warm stones to massage and soothe away muscular tension. Sauna before your massage to maximise the therapeutic effect. Our Therapists Kim, Maree and Rosie perform this post-graduate specialised massage. Offering more understanding of the changes to our bodies as the pregnancy progresses and therefore able to meet your needs. Infrared saunas use ceramic heaters that radiate a continuous infrared light/heat. This means it warms our body directly rather than having to warm the air first, much like the sun warming our body on a cold winter's day. Because of this major difference between an infrared sauna and a traditional sauna, there is no need for very hot air that can cause respiratory problems and dizziness. Infrared only expends 20% of its energy on heating the air, 80% directly, and deeply warms the body. This means significantly cooler and more comfortable air temperatures. Infrared has been researched and used in medical practices for over a hundred years. Sports medicine has long accepted and used infrared to promote healing of muscle and connective tissue injuries. An excellent way to detoxify the body. Use the sauna before your massage.